For the third time this year, an ambulance was called to a Planned Parenthood abortion facility in Spokane, Washington. The incident took place on September 16, 2015. According to the 911 recording obtained by Operation Rescue show that the Planned Parenthood caller hesitated when asked by the 911 dispatcher what happened. “Um, uh, uterine perforation,” the Planned Parenthood caller said. A uterine perforation is a hole torn in the woman’s womb when the sharp suction cannula that is used to dismember the baby is thrust too deep into the uterus. This can be a life threatening injury depending on the severity of the tear, whether other internal organs were damaged, and the amount of internal bleeding that occurs. Uterine perforations can usually be repaired, but may result in hysterectomies in severe cases. 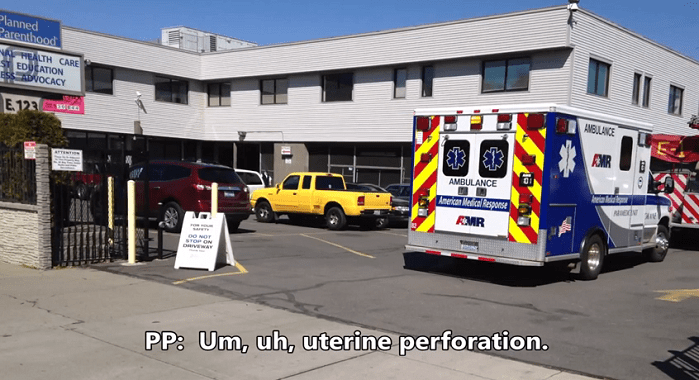 Other medical emergencies this year at the Spokane Planned Parenthood took place on January 7 when a woman was transported due to “abdominal pain” and on April 15 when a hemorrhaging woman was sent by ambulance to a hospital emergency room. Earlier this week, Operation Rescue reported a botched abortion at the Planned Parenthood abortion facility in Houston, Texas, on August 4. That represented the 10th abortion-related medical emergency at that facility, which was featured in a video released by the Center for Medical Progress earlier that same day. The Planned Parenthood official who contacted 911 in that case was featured in the CMP video describing how easy it is to harvest fetal eyeballs. Out of the dozens of medical emergencies documented by Operation Rescue so far this year, 64% of them took place at Planned Parenthood abortion facilities. While Planned Parenthood conducts 40% of all abortions in the U.S., Operation Rescue’s data shows that it is responsible for 64% of the abortion injuries that require emergency hospitalization that have been documented by Operation Rescue so far in 2015 alone. “Planned Parenthood’s claim to be a ‘high quality’ abortion business has been debuked. The facts speak for themselves,” said Newman. Operation Rescue calls for the defunding of Planned Parenthood and for the criminal prosecution of Planned Parenthood employees who have broken the law. • Contact your Congressman and demand that no Federal tax money be given to Planned Parenthood. • Sign up to attend a peaceful nation-wide protest at Planned Parenthood facilities across America on October 10, 2015. Visit ProtestPP.com for more information. This entry was posted in Pro-Life and tagged Planned Parenthood, uterine perforation, women dying from botched abortions. Bookmark the permalink. More bad news for Planned Parenthood. These continuing revelations demonstrate the evil corruption of this organization and its blight upon our nation. I am a Christian-Zionist and very Conservative Patriot in our Judeo-Christian Nation USA!! Our True GOD DOES not Condone Abortion PERIOD!! ABORTION is MURDER!! Our True GOD who art in HEAVEN said : “Thou Shalt NOT KILL”( Exodus 20:13 KJV )!! Please PRAY for our Judeo-Christian Nation United States of America and Israel-Yisrael Everyday Everyone!! “PRAY WITHOUT CEASING” ( 1 Thessalonians 5:17 KJV )!! I’m curious who the abortionist(s) is/are. The search engines just bring me back to boilerplate PP stuff with different outfits. Got any ideas?